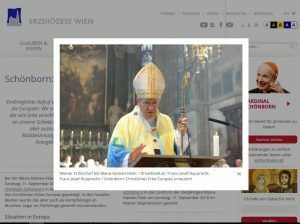 Vienna (kath.net) The Viennese Cardinal Christoph Schönborn is now under pressure in the Causa "Bishop Alois Schwarz". 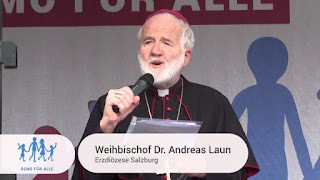 He said in an interview with ORF Niederösterreich on Wednesday that he was "confident" that there would be an "honest clarification" of the allegations against the former Carinthian Bishop Alois Schwarz. "If charges are made against a bishop, then you have to of course explore, examine and look at it.” This statement makes Carinthia shake his head. On Thursday, Gabriel Stabentheiner, Organizational Officer in the Church Contribution Service of the Diocese of Gurk-Klagenfurt and Chairman of the Works Council of the Catholic Church, Carinthia, published an open letter to Cardinal Schönborn. Schönborn is sharply criticized in this letter. And Schönborn is called upon to stop "constantly placating the public with such statements or writing them of as stupid.” According to Stabentheiner, Rome has known about everything for a long time. He himself was with a group of people a few years ago to visit the competent Bishop, Alois Kothgasser to inform him about the conditions in the diocese, writes Stabentheiner and who continues to ask. "Why was Schwarz made the financial bishop?" 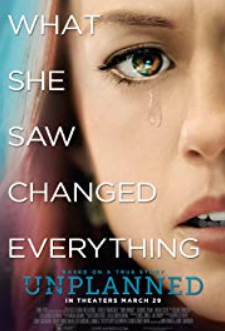 However, he already knew everything, Stabentheiner then asks Schönborn why he also made Schwarz the financial bishop of the Episcopal Conference. Schwarz himself is silent to all accusations so far. Meanwhile, in the Cause "Bishop Schwarz" now another Austrian news magazine has weighed in. As reported by the news magazine "Profil", the Diocese of Gurk owns a house on the Rabensteig in downtown Vienna, in which Schwarz rented an apartment. The rent for the apartment, which has more than 100 square meters, is estimated at 1900 euros. However, Black paid less than half of it, reports "Profil." According to a spokeswoman the present bishop of St. Pölten, Schwarz, has dissolved the lease. In addition, according to the magazine Schwarz has violated canon law. This is evident from the test report submitted by the Gurk cathedral chapter, which at the beginning of the year 2018 dissolved the economic council provided for in the statutes of the diocese of Gurk. Incidentally, according to "Profil,” Schwarz is even on the Economic Council of the Archdiocese of Vienna, where he supervises its conduct. 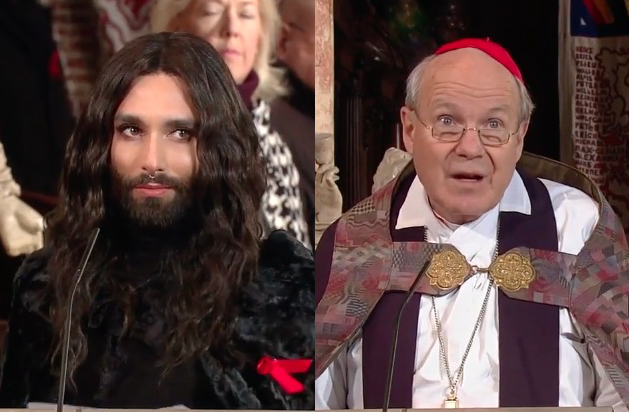 Schönborn Event Transformed "Into a Clear Pro-Homosexual Statement"
Vienna (kath.net) "Ethically, he should not have done that, because he also has not organized any major memorial services for the victims of cancer or circulatory diseases or accidents." With clear criticism of the controversial AIDS event in St. Stephen's Cathedral on the 1st of December, Andreas Unterberger, the well-known Austrian political blogger, spoke up. The event was held in collaboration with Gery Keszler, the organizer of the controversial Life-Balls. At the ecumenical event, inter alia, the deviant Conchita Wurst also offered an intercessory prayer. Although Unterberger, the former editor-in-chief of the Wiener Zeitung, praises Schönborn's criticism of the judgment of the Constitutional Court on gay marriage, he criticizes the fact that these "wise words" are thwarted by the event in St. Stephen's Cathedral. The Schönborn commitment had become a clear pro-homosexuality statement, "because AIDS is closely, if not exclusively, connected with the sexuality of this group." Vienna (kath.net/KAP) According to Cardinal Christoph Schönborn, the Cross has important functions in public space. "The cross should change something, make the world more equitable, otherwise it is an ineffective piece of culture," the Viennese Archbishop said in his Friday column of the free newspaper "Heute" in the current cross-debate. The symbol of Christians should not be seen as a "jewel in a cultural museum," but rather as a reminder. In the courtroom, according to Schönborn, "it should remind the judges that God expects them to be righteous and not partisan," and that "the poor and defenseless are to be treated just as well as the rich and powerful." In the school, the cross calls to mind "that children are not bullied, that teachers should support the weak." In the hospitals, the cross shows "that the suffering man has his dignity, even if he is destitute." The Cardinal has been at a distance from the current cross-debate, which was triggered by the discussion about head coverings and burkas. Some would call for "ideological neutrality" in public space and wanted to "ban or even ban anything that recalls a religion." Others have described the cross - but not the Burka - as part of the culture. "This discussion is a dead end," says Schönborn. Supsension Against Don Uribe Lifted. Did Bishop Corredor do this after reading Cardinal Schönborn's heretical interpretation? (Bogota) Don Luis Carlos Uribe Medina, the priest of the Colombian diocese of Pereira, was reinstated by the bishop in his office. Don Uribe has become the "first martyr of Amoris laetitia." Because of his criticism of Amoris laetitia and his pastoral implementation was characterized as an attack against the indissolubility of sacramental marriage the priest had been treated by his bishop as a heretic and schismatic. He had "apparently" had detached himself from "communion with the Pope", so he was suspended by his bishop a divinis suspended . Don Uribe's suspension from the priesthood attracted worldwide attention because he had not committed any fault, except to defend the past [and immemorial] doctrine and practice of the Catholic Church. The sensation seems to have produced an effect. On January 31, Bishop Rigoberto Corredor Bermudez, diocesan bishop of Pereira, reinstated Don Uribe in his priestly power. For this, the Bishop and Don Uribe signed a joint statement. Therein it is explained that Don Uribe, after a "fraternal conversation" with the bishop, has declared of his "free will" that he would "remain obedient and respectful towards the Holy Father Francis and my diocesan bishop in the Apostolic teaching and tradition of the Church." With "permission of my diocesan bishop, I resume my priestly service from today, January 31, 2017". 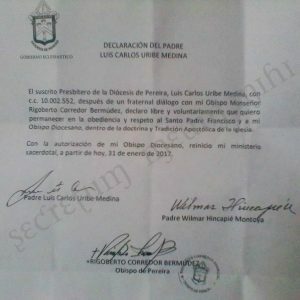 An image of the original document signed by Don Uribe and Bishop Corredor about reintegration into the diocesan clergy was published by Secretum meum mihi with the explanation that Don Uribe finally confirmed only what he had said anyway. 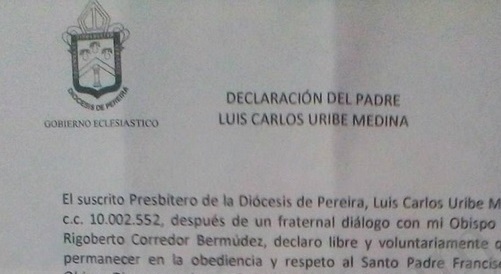 As Radio Rosa Mistica Colombia reported, Bishop Corredor had corrected his penalty after he had come to a full understanding of Don Uribe's statements. Specifically, the radio station, points to the Amoris-laetitia -Interpretation of Cardinal Christoph Schönborn of 8 April 2016. Pope Francis had a few days later referred to "the Schönborn-statements as the authentic interpretation" of the controversial post-synodal letter. Don Uribe had criticized and rejected Schönborn's interpretation. He also criticized Pope Francis, because the latter had described Schönborn interpretation as "authentic" and thus made his own. After Bishop Corredor had read the Schönborn-text, he had changed his mind about Don Uribe and withdrew the sanction, says Radio Maria Mistica Colombia. The station cites its own source which remains unnamed. Vienna (kath.net/KAP) Cardinal Christoph Schönborn has expressed shock at the resistance from Church circles against Pope Francis: "It hurts me that he faces so much hostility - within the Church. What is this? He is the successor of Peter! He's the pope!" said the Archbishop of Vienna on Tuesday in his homily during the Medjugorje prayer of peace, "Message for you" in the cathedral. Many people in the world are grateful for the witness of Pope Francis. "For his kindness and his love for the poor and the fallen. It is the gospel that he teaches us," said Schönborn. To learn that the Pope is receiving "so much resistance" from his own ranks, was completely incomprehensible to him. It is important to pray for the Pope. Regarding the so far not carried out confirmation by the Vatican for the alleged [and heretical] Marian apparitions in Medjugorje, the Cardinal called on the faithful to be patient. You should "persevere and remain faithful in prayer and intercession," said Schönborn, and continued: "I think to myself, God knows why he is linked to Medjugorje, so patience requires of us thus our heart is willing.. " As one of the positive consequences of the events of Medjugorje, Schönborn described the emergence of numerous prayer groups around the world and also in Austria. It was particularly noteworthy that these groups since their inception in the 1980s - the Viennese Dominican Church was then a starting point - would largely continue to exist to this day, said the Archbishop of Vienna. The Medjugorje prayer groups were the focus of this year's Peace Prayer again with around 4,000 believers who had come to St. Stephen's Cathedral. 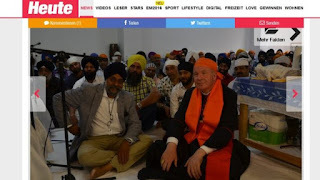 Currently I am tempted to link the dozens existing groups in Austria with each other more, explained Christian Stelzer of the prayer community "Oasis of Peace", who had organized the prayer for peace. Is Cardinal Warning of an Islamic Invasion of Europe? (Vienna) "Schönborn warns of Islamic conquest of Europe" (ORF), "Schönborn: 'Many Muslims want a conquest of Europe.'" (OE24). The headlines reveal a suspicious departure from the current "Welcome Culture". But is that really true? Vienna's Archbishop, Cardinal Christoph Schönborn, was thought to be one of the most active advocates of an unrestricted opening of the border for mass immigration. It's a process which proceeds more under the heading "Refugee Aid", and has dominated the political debate since last year not just in Austria. Church institutions are among the main service providers that organize the reception of refugees professionally on behalf of the state. However, a majority of them are economic migrants, as government politicians now admit. The proportion of genuine refugees under the international conventions is given, depending on the estimate at 20-33 percent. Each genuine refugee, therefore, is up to four economic migrants entering the country. However, Cardinal Schönborn has refused to make, together with Caritas and much of the political elite, any differentiation. It's a refusal which corresponds to the attitude of the immigration party par excellence, the Greens, which was taken in 2015 from still unknown reasons from both Austrian government parties, the Social Democratic SPÖ and the Christian Democratic People's Party. The resulting bold slogan, Refugee Welcome, comes from the vocabulary of the extreme left. "Nobody has the truth, and you yourself do not." In Catholic circles in Vienna the statement, unusual for a Catholic bishop, was read as a benevolent signal to the lodge brothers. Van der Bellen had been a member in 1975 of the Masonic Lodge in Innsbruck. In contrast, his opponent Norbert Hofer, of the nationalist, conservative Freedom Party of Austria at (FPÖ), has the Order of St. George, by which the Cardinal seems but very little impressed. "That Christians are, either thoughtless or, even worse, are already so brainwashed that they are prepared to choose a declared God and therefore enemy of the Church - and that others also want to seduce - shows what condition circles in the Church are." The election was subsquently annulled by the Constitutional Court because of irregularities and must be repeated in the autumn. Whether Schönborn will repeat his election manifesto, which not supposed to be one, will be repeated or not, should be the test of truth for statements made last Sunday and the credibility of the Church in Austria. In December 2015 Schönborn had, for the Slovak weekly magazine Týždeň, sharply criticized the "refugee policies" of the immigration policies of countries neighboring Austrian: Hungary, Czech Republic, Slovakia and Poland. He accused the governments of these countries of being "blinded by a vicious propaganda". He was "ashamed" of the rejection of a mass immigration by these countries "in so-called Christian arguments" like the "fear of Islamisation". A "rational calculation" shows that Europe "needs millions of immigrants to maintain our lifestyle." What Schönborn honestly reveals, indicates that there are in reality very different motivations behind the "refugee crisis." Yet on March 13, 2016, Schönborn reiterated on ORF television Press Hour of the Austrian Church Hierarchy "consistently incorrectly analyzed mass immigration" (see The Church "Refugee" - Craze Continues - Cardinal Schönborn's Dangerous Illusions and the Decline of the Church ). The attitude of the church hierarchy was marked by "clandestine agreements, self-censorship, confused talk" and "siding with the powerful," says the Catholic theologian and Pro-lifer Wolfram Schrems. 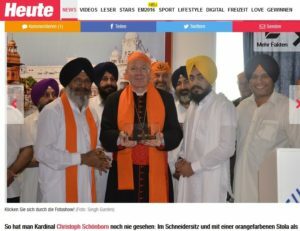 But what is Cardinal Schönborn saying now? "Today 333 years ago, Vienna was saved. Will there now be a third attempt at an Islamic conquest of Europe? Many Muslims think and wish that and say: This is Europe at the its end. And I think that Europe today should ask as Moses today's reading and what God the Merciful does with his younger son: Lord, give us another chance! Do not forget that we are your people just as Moses reminds him: It's YOUR people, YOU have led them out, YOU have sanctified them, they are YOUR people." Schönborn's Maria Name Day sermon and its "clarification"
The statement is less spectacular than some media have stressed. And yet, from the mouth of Vienna's archbishop it is something spectacular to hear that he is convinced that "many Muslims think and wish" that there will be a "third attempt of an Islamic conquest of Europe". As to being a real "warning", such as claimed by the ORF, it was not, however. Where id it the cardinal said this? The statement came on September 11, at the end of his homily for this year's Mary Name Day Ceremony in Vienna's St. Stephen's Cathedral. The festival is an annual meeting, which was founded by the Franciscan Petrus Pavlicek at the 1947 prayer a0ction, "Expiatory Rosary Crusade." Cardinal Schönborn is reputed to have the adaptability to accommodate his respective audience. Is this true for his homily last Sunday? Was it a rush of realization from a process of reflection that led the Cardinal to the conclusion that "Europe is at the end" that Europe "is well on the way of forfeiting its Christian heritage"? Or is the Cardinal only addressing a pious and "conservative" target audience? "Do not get my message as a call to arms against the refugees". He also referred to the website of the Archdiocese of Vienna, where "the intention of the sermon was again clarified" than as ORF reported. The archdiocese had published the sermon in the text and to be safe, included commentary to prevent any misunderstanding from arising. The blame does not fall upon Islam, not even the Islamists, insisted the cardinal. "We put the Christian heritage of Europe in danger." The commentary explains: "Islamism could indeed may be the beneficiary [...]. But hope lies in the mercy of God." Then the comment is even clearer: "From the context it is also clear that the Cardinal does not care to enter into a defensive struggle to defend Christian values ​​against Islam ". "Europe's Christian heritage is at risk because we Europeans have squandered it. It has nothing to do with Islam or even the refugees. It is clear that many Islamists would like to take advantage of our weakness, but they are not responsible for our weakness. We are, the Europeans ourselves." So there is nothing new in Vienna? "Nothing new," confirms a Viennese informant. 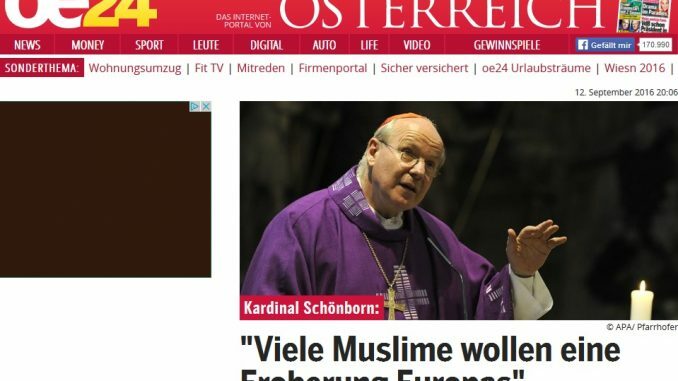 Cardinal Schönborn: "Will There be an Islamic Conquest of Europe?" Austrian Cardinal Christoph Schönborn made the warning on Sunday during the church festival "Holy Name of Mary", which was first introduced 333 years ago in gratitude for the victory over the Ottomans in the Battle of Vienna. According to the Archdiocese of Vienna, the cardinal said: "Will there be an Islamic conquest of Europe? Many Muslims want that and say: Europe is at the end." He asked God to have mercy on Europe and to show mercy to its people, which he said "are in danger of forfeiting our Christian heritage". Schönborn explained that people could already feel this loss, "not only economically, but above all, in human and religious matters". The cardinal's statement came as many places across Austria commemorated the 333rd anniversary of the Battle of Vienna. During the battle on 11-12th September 1683, combined Christian forces defeated over 100,000 soldiers from the Ottoman Empire. Müller to Mainz, Schönborn and Maradiaga to Rome? Who is Playing the Game of Rumors? (Rome) At certain intervals the rumor mill surrounding the Roman Curia will run. Currently, there are several speculations, of which the most important would be particularly worrisome. Currently, however, it is unclear who is playing what game with the rumors, and which part of the gossip has veracity. The previous Prefect, Cardinal Gerhard Müller, it is rumored, will be the new Bishop of Mainz and succeed there Cardinal Karl Lehmann, who was retired last May 16 with the completion of his 80th year. The new Cardinal Prefect of the Roman Congregation is supposed to be Vienna Archbishop Christoph Schonborn. The fact is that the relationship between Pope Francis and Cardinal Müller is severely strained, while the President of the Austrian Bishops' Conference is currently experiencing a flight of fancy in the papal favor. Both such contrasting movements have not the least to do with the Post-Synodal Exhortation Amoris laetitia. It's not about questions of sympathy but a tangible and fundamental factional dispute. Behind this is the question of where Pope Francis will lead the Church. The Pope has ignored Cardinal Müller, who recently, along with the entire CDF, recently attacked. though only indirectly, the unassailable Pope Francis, but with a breathtaking statement, accusing the Pope's ghostwriter, Titular Archbishop Victor Manuel Fernandez, of being "heretical". The three magisterial documents by the Pope: Evangelii gaudium (2013), Laudato si (2015) and Amoris laetitia (2016) all come from the pen of Fernandez. Cardinal Schönborn in turn was also rumored in 2005 to succeed Joseph Cardinal Ratzinger in the CDF. However, the German pope decided otherwise. In 2012, the Vienna archbishop hailed the decision, to appoint the then Bishop of Regensburg, Gerhard Ludwig Müller, as the new CDF, as an "excellent choice". Since then, however, much has changed, especially the Pope in Rome. The rumor is to be treated with caution: First, the explosive reshuffle has been disseminated by the progressive media. In German-speaking parts it's KNA, the press agency of the German Bishops' Conference was responsible. Secondly, KNA published its information on the basis of information published in the faraway Malaysia Catholic Herald newspaper of the Archdiocese of Kuala Lumpur. Verification was not even possible on demand. The probability that a diaspora institution would serve as the first media reporter of so far-reaching a reshuffle is not impossible, but extremely low. The closer one comes to the progressive Spanish news site Religion Digital, which is known for its notorious papolatria since the recent conclave. It took over the role of KNA in the Spanish-speaking world and maintains good contacts with the Honduran Cardinal, Óscar Andrés Rodríguez Maradiaga. The progressive organ headlined several times in recent months, with headlines in the way: "Francis Builds, Müller Destroys." Rylko back to Poland, Maradiaga still on his second attempt to Rome? The rumors of personnel changes affect not only the cardinals Müller and Schönborn. According to the same source, the 77-year-old Cardinal Stanislaw Dziwisz, the longtime first secretary of Pope John Paul II., is to be replaced as Archbishop of Krakow by Cardinal Stanislaw Rylko, the current President of the Council of the Laity. This would be due to the dissolution of the Council for the Laity, whose responsibilities will be incorporated into the upcoming September 1 Congregation for Family, Laity and Health Pastoral. The first prefect of the new congregation would be likely to be the Pope confidant Cardinal Óscar Andrés Rodríguez Maradiaga of Honduras. Maradiaga, who received the title of "Vice Pope" because of his euphoric appearance in the first months of the current pontificate is coordinator of the C9-Cardinal Council in support of Pope Francis in the reform of the Curia and the guidance of the universal Church. Recently, however, it was become pretty quiet around the Honduran Cardinal. In 2010, he was already being talked about as candidate for a Prefect of a Roman Congregation. He was to take over the management of the Congregation of Religious. However, the Brazilian Joao Braz de Aviz was appointed, who has been hunting the Franciscan Friars of the Immaculate since 2013. Stubborn voices wanted to know if Cardinal Maradiaga had recommended himself recommended for the Roman post. Cardinal Angelo Amato, the current prefect of the Congregation of Saints is to be replaced because of his age of 78 years by the current substitutes of the Cardinal State Secretariat, Curia Archbishop Angelo Becciu. New assistant and thus right hand of Cardinal Secretary of State Pietro Parolin will be the current apostolic nuncio in Lebanon, Titular Archbishop Gabriele Caccia. The next few days and weeks will bring clarity. Until then, the rumor mill should be given little credence, since for the time being things remain opaque, what game is to being played at and which part could be true. The fact is that the rumors claiming personnel switches around the CDF would drive the wedge of Pope Francis and his entourage deeper into the body of the Church. In the past few days another German cardinal, Cardinal Walter Brandmüller, warned of the "very great danger" of a schism. Kuala Lumpur (kath.net/KNA) Accordjng to a report by the Malaysian Catholic weekly "Herald" Pope Francis plans personnel changes within the Curia. This suggests that the former prefect of the CDF, Cardinal Gerhard Ludwig Müller (68) will occupy the See if Mainz long since vacated by Cardinal Karl Lehmann. In return, the Viennese Cardinal Christoph Schönborn (71) is to switch to the Vatican and take over there, the management of the CDF, the Journal reported over the weekend, citing "well-informed Vatican sources" on its website. There were indications that the pope also plans the appointment of Cardinal Stanislaw Rylko (71), Polish cardinal and President of the Pontifical Council for the Laity, Archbishop of Krakow. He would assume the office of the 77-year-old Stanislaw Dziwisz, who has already reached the age limit for resignation. The paper refers to a decree by the Pope, according to which the Council for the Laity and for the Family will be merged on 1 September into a new office. Its statutes were published by the Vatican in early June. According to "Herald" it will be incorporated into an office of pastoral health care. The new formation will receive the status of a congregation with the decision making power. As head of the new Congregation, the Honduran Cardinal Óscar Andrés Rodríguez Maradiaga (73) has been selected, a close confidant of the pope and head of the Cardinal Council for a reform of the Curia. Another of the personnel according to the "Herald" referrs to the Congregation of the Causes of Saints. The Vatican Interior Minister, Archbishop Angelo Becciu (68) is supposed to replace the earlier head, Cardinal Angelo Amato (78). The director of the Vatican Secretariat of State is to be the former apostolic nuncio in Lebanon, Archbishop Gabriele Giordano Caccia (58). (C) 2016 CBA Catholic News Agency. All rights reserved.